I totally missed the time change yesterday morning. I must be out of touch. So instead of it being 10:00 when we were leaving the house to go out for breakfast, it was actually 11:00. We decided to take a ride to Calumet and go for lunch instead. We went to Jim's Pizza, an institution in Calumet, which has been in the community for at least 40 years. It has a very casual diner-like setting. Burgers, pizza, sandwiches, salads and other short orders are featured on the menu. Ron loves their pizza; they ordered a half cheese and sausage and half cheese, sausage and ham. 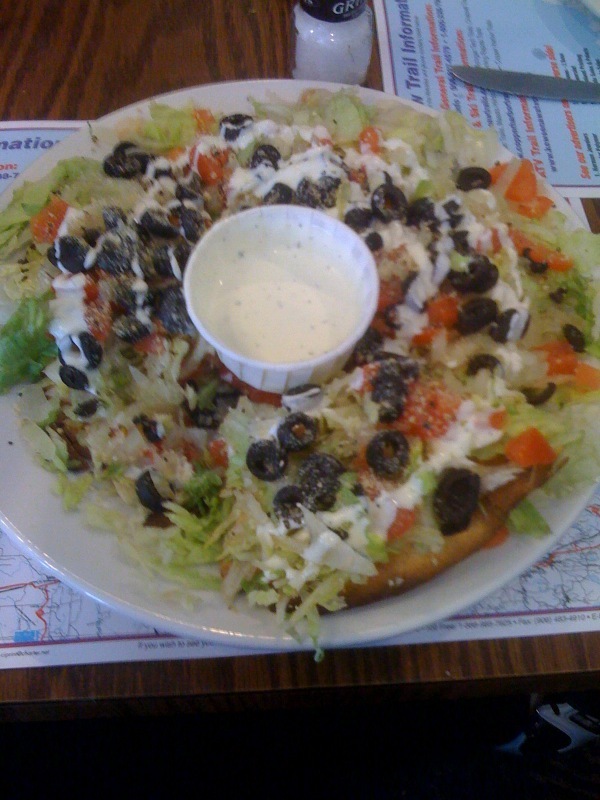 I ordered a 'salad pizza', a unique dish that is basically just that, a salad placed on pizza crust. I really enjoyed it. 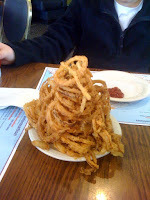 For a starter, we ordered Jim's home made onion rings. I have loved these things since I was a kid. The are great and come piled high on a plate. Enough for all to share. This is the only dish that I eat with ketchup. Jim's is a great place to take the family. It is inexpensive, quick service, and consistent food. Let's hope it stays open another 40 years.